Adoption of leading-edge technology can be an intimidating process. Lack of familiarity, trepidation surrounding what may be a steep learning curve and the ability to leverage such an investment into success, to say nothing of the level of investment itself, causes many manufacturers to stick with what’s tried and true. Tried-and-true, though a comforting proposition, often steers companies into the slow lane, as more agile competitors adopt and adapt, and speed on past along the manufacturing highway. 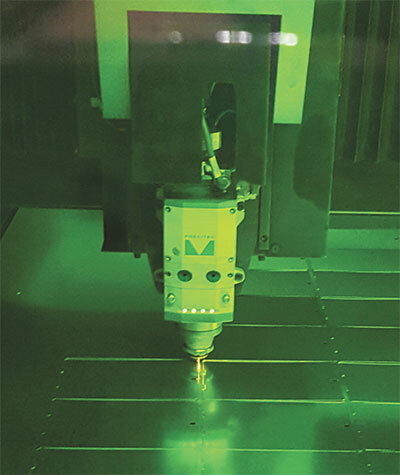 A 3-kW fiber-laser cutting machine has allowed Weber Specialties to serve low-volume customers while gaining flexibility to produce prototypes and adapt quickly to changes in part designs, all while cutting lead time in part production. Weber Specialties Co., brought to life as a tool-and-die partnership in 1943, incorporated in 1955 and eventually evolving into a supplier of stamped and fabricated components, found itself in the position of having to adopt and adapt. And that it has done with the early-2016 addition of a fiber-laser cutting machine. The technology has filled a production hole at the Schoolcraft, MI, based manufacturer while also delivering flexibility as well as time and cost savings to its customers. With two plants offering 100,000 sq. ft. of manufacturing space under roof, Weber Specialties and its 80 employees serve a variety of markets, including appliance, automotive, furniture, medical, electrical and industrial-hardware. It performs tool build, stamping, fabricating, assembly and painting inhouse, using a variety of part materials. Though successful, the company wanted to limit some of its outsourcing operations. The new laser-cutting machine easily handles Weber Specialties’ typical part stock, including low-carbon, coated and stainless steel; advanced high-strength steel; aluminum; brass; and nickel; in thicknesses from 0.010 to 0.5 in. In addition, though proficient at high- and medium-volume work, “the need for a new machine centered around trying to address increasing demand in the low-volume work environment, using laser capability to cut ferrous materials,” he adds. An upgrade to 3-kW power enables the FS 3015 to easily handle the company’s typical part stock, including low-carbon, coated and stainless steel, advanced high-strength steel, aluminum, brass, and nickel, in thicknesses from 0.010 to 0.5 in. The machine features a durable rack-and-pinion motion system, lightweight cutting bridge with synchronized dual servo motors and a quick-change noncontact cutting head. Offering energy saves to 70 percent as compared with traditional CO2 laser cutters, the FS 3015 provides cutting feed rates to 1000 in./min and traverse speed of 6700 in./min. with 1.5-G acceleration, according to HK officials. 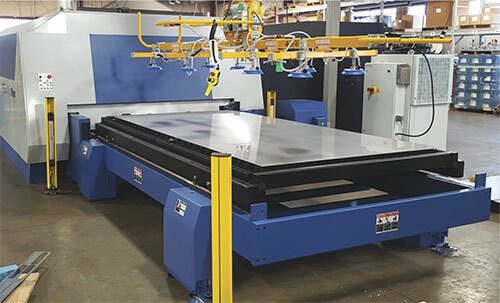 Upon install, the company, benefitting from offsite and inhouse training backed by the machine’s library of material-cutting conditions and job-recall capability, quickly realized the advantages of fiber-laser cutting. 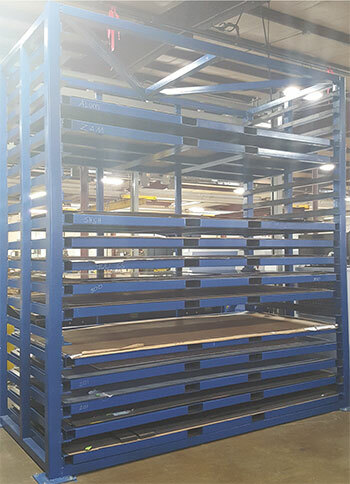 Weber Specialties added storage racks to handle sheet for the hungry laser cutter, and is looking at ways to add sheet remnants to its inventory-management system to better serve low-volume customers that may not require full sheets for limited part production. On the shop floor, Weber Specialties employs the fiber-laser cutter as a standalone machine. Bozell points to a number of examples where the machine has paid off. Such flexibility enables rapid reaction to customer changes, and also assists with customer indecision. To outsource this type of work would have been costly, with lead time becoming a significant issue. Interestingly, addition of the fiber-laser cutting machine has created an unexpected challenge, one that Bozell sees as an opportunity for Weber Specialties.